Giving a housewarming gift is a great way to share and celebrate the happiness of shifting to a new home. It helps to keep memories alive especially when the gift is something they see every day. 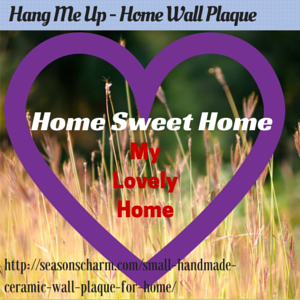 A small handmade ceramic wall plaque for home would help to keep such happy memories alive. Made of natural colored stoneware soft pliable clay with a baked on glossy finish, the wall plaque comes in a nice oval shape. The sentimental and meaningful message is conveyed using dark blue color letters. Measuring 4″ x 6″, this home wall sign is made in Vermont, USA. 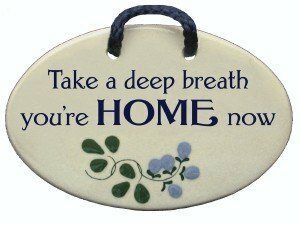 Individually handmade and beautifully designed, this meaningful wall plaque really reminds you that Home is best. It can be a nice stress reliever coming home after a stressful day at work. The handcrafted decorative wall plaque with sayings looks really cool hanging on the front door or wall. This meaningful fun crafted small wall plaque looks just as cool on the mantlepiece gently reminding you of your home sweet home.